Every cattery needs to have a cleaning routine... and the mainstay of cleaning products is good old-fashioned bleach. Used by our mothers and grandmothers to keep our homes clean and germ-free, bleach continues to be a popular cleaner in the cattery too. What Is the Difference Between Ultra Bleach and Regular Bleach? Ultra bleach is more concentrated than regular bleach, but it is just as safe to use as long as you make adjustments in the dilution you use. 3/4 cup ultra beach is equivalent to one cup of regular bleach. 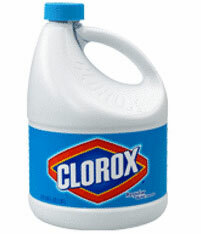 If a formula requires 1/2 cup (4 ounces) of regular bleach, the equivalent is 3/8 cup or 3 ounces of ultra bleach. Instead of 1:32 regular bleach to water, ultra is about 1:42 parts bleach to water for ideal surface disinfecting purposes. If a formula simply says "bleach", it is safe to assume that refers to regular bleach. Can I Use the Flower-scented Formulas Instead of Regular Bleach? Yes. The active ingredients are the same. Some people who object to the smell of regular bleach will find the newer options easier to live with. so you MUST clean dirt, hair, feces, etc., BEFORE using bleach. Bleach is usually diluted with water to create a cleaning solution. It is excellent for cleaning non-porous household or cattery surfaces including quarry tile, linoleum, ceramic tile, fiberglass, grout, kitchen counters, sinks, etc. has always served me well with minimal irritation or risk to me or my cats. I leave almost everyone out while I mop with a dash of bleach in a water. I do put young kittens up or some persistent Devon who won't take "no" as a response to standing on the rim of the mop bucket. A few minutes of fresh air and we are done. By the time the floor dries, at least 15-20 minutes has passed - time enough for disinfection to be complete. Most of the time for kitten-pens and nursing areas, I just spot clean with 3% hydrogen peroxide, it works very well on milk, oils, urine, or feces, while leaving little residual bad odor. If their area is very dirty, I'll use a weak bleach rinse after the peroxide, wipe dry, wait awhile, then put everyone back. In hospitals, an approved method of cleaning bedpans is to cover their contents with 1:10 bleach, then dump the whole mess into the toilet. Personnel then clean the bedpan with soap and water to remove any solid waste, dump it again, then rinse in 1:100 bleach solution and return it to the patient's room. Bleach and feces can create a noxious compound (chloramine gas) when combined, so here's how I clean my litter boxes. I'm done after the few minutes it takes the bleach-spray to dry. Simple, yet I feel confident that the litter boxes are clean and disinfected, all with minimal irritation to me. Soak the items in a mild bleach solution for 10-20 minutes (1:100 bleach-to-water dilution). Alternately, hard plastic toys can be washed in a dishwasher or hot cycle of a washing machine. Cloth or plush toys should be machine washed using the hot water setting or dry-cleaned. To disinfect miscellaneous small items, literature dealing with the aftermath of floods recommends that kitchen utensils, etc., first be washed in a strong detergent solution using a brush as necessary to remove any dirt. Items are then rinsed in hot water. Following this, you can immerse glass, porcelain, china, plastic dinnerware, enamelware, etc. for 10 minutes in a disinfecting solution of 2 tablespoons of chlorine bleach per gallon of hot water. Two tablespoons - so little! Since bleach reacts with many metals and causes them to darken, the disinfection of silverware, metal utensils, and pots and pans is done by boiling them in water for 10 minutes or running them through the dishwasher if the hot water temperature is at least 140º F (60 º C) using a long wash cycle with a heated drying cycle. See? Just a few tablespoons of bleach disinfects the things you're going to use to prepare food and eat it. Do your cats and kittens need more bleach for their things than you? I think not. Ringworm requires a 1:10 dilution (1 and 1/2 cups bleach/gallon of water, or 1 part bleach to ten parts water). Some studies say you may kill all or most of the ringworm, but only about 20% of Ringworm spores, but that's not bad, considering few other products do as well. If you clean first, then bleach, then steam, for the whole process you'll get even more of the spores. A 1:10 dilution is considered to be very strong, so you'd only want to use this 1:10 concentration for Ringworm or other very special occasions. It's much too irritating for casual use. Want to get rid of mold or mildew? Wash the mildewed surface with 1 cup bleach to water or 3/4 cup ultra bleach to water. Towel dry surfaces and reapply bleach solution as necessary to remove all stains. Allow surfaces to dry then prime and paint. On bare, damaged wood, like that found around old windows, use the 1:10 bleach dilution to get around any organic issues that might impede disinfection. I worked part-time for a few months at a pet store/boarding facility some years ago. We used only a bleach solution for cleaning. Although there were many special needs kitty clients, not one ever got sick. To spot disinfect in just 30 seconds, use the spray by Clorox called Clean-Up w/Bleach. It contains 1-5% bleach (Sodium Hypochlorite) plus the stabilizer Sodium Hydroxide (0.5-2%). In 30 seconds it kills Pseudomonas aeruginosa, Salmonella choleraesuis, Staphylococcus aureus, Rhinovirus, Hepatitis A virus, Influenza A2/Hong Kong virus, and mildew. If you wait 2 minutes, you are assured of killing HIV-1. If someone has had an accident, you can spray the mess, wait 4 minutes, wipe up, and you've disinfected. If you are the patient type, wait 5 minutes, using the spray straight or diluted 1:16 and you can kill Staphylococcus aureus, Salmonella choleraesuis, Pseudomonas aeruginosa, Influenza A2/Hong Kong virus, Hepatitis A GAV-1, Rhinovirus, Trichophyton mentagrophytes, and the mold Aspergillus niger. To be thrifty, dilute the spray to 1:32, wait 5 minutes and you've killed HIV-1. Government recommendations to deal with areas contaminated by heavy duty blood borne pathogens call for the areas to be saturated with 10% bleach (1:10) for 10 minutes. In 10 minutes you wipe up the area, then wipe again with fresh disinfectant. The government's Special Pathogens Branch recommends this same 10% bleach to inactivate hantaviruses (remember the "Black Death" that killed millions during the Middle Ages?). Studies show that probably as little as 0.38% (200 ppm) would do a number on the plague bugs, but they allow for the fact that bleach is quickly and substantially inactivated in the presence of organic matter. The plague is carried by rodents (both people and cats can become infected through airborne particles), so when cleaning out rodent-infested areas, the government thinks 10% bleach is the best. Are There Any Drawbacks To using Bleach? The drawback to disinfection using bleach is that no matter what concentration of bleach-to-water you use, only the outside layer of the material to be disinfected is bound with the chlorine molecules in the bleach solution unless the object is entirely soaked through. Complete soaking is most easily achieved when greater quantities of water are used, so don't be stingy, drench the area to maximize penetration. Using lots of bleach-water solution verses some of the other cleaners is safer and cheaper. Heavily soiled and contaminated articles will require lots of any disinfectant. But really, it doesn't take much bleach for ordinary cattery disinfection. Let's look at another situation that requires disinfection - Viral Hemorrhagic Fevers (Ebola, Marburg, etc. ), the group of diseases popular in medical horror novels. Our US government recommends using only a 1:100 dilution of bleach to water to clean and disinfect spills of infectious body fluids. Only if the spill is heavy or dense, or the contaminated surfaces are porous and not easily pre cleaned do they recommend moving up to a 1:10 dilution. In either case, suggested wait time for disinfection is just 15 minutes. They claim surfaces such as tabletops, sinks, walls, and floors are not generally involved in disease transmission, so even in a bad, bad disease outbreak, you still just use a 1:100 bleach to water dilution. If a patient lives long enough to need eating utensils, the recommendation for disinfection is to wash all utensils in soap and water, following this prewash with a 1:100 bleach rinse, then air drying. Furthermore, a "weak" dilution of 1:100 bleach to water is used to wipe stethoscopes, thermometers, other medical equipment, boots, gloves, etc. If medical and support personnel aren't worried while working around highly infectious patients using only a 1:100 bleach solution for most disinfection needs, should we worry so much about our cattery practices? Quite a few organisms have a very short life outside the cat, lasting only a few hour or a day at most on counters, desks, etc. Others, like Panleukopenia, last a very long time, as do ringworm spores. Ringworm spores are said to remain viable for up to two years. But not to be discouraged. Did you know that guidelines for after-flood clean-up all seem to recommend the use of 1/2 cup of bleach/gallon of water (1:32) for the final disinfecting rinse of most hard surfaces? River floodwaters can bring a lot of very nasty germs into play, but everyone is happy with just that 1:32 beach to water dilution. That's not much at all. For cleaning clothing after a flood, they stick with standard bleach recommendations you or I use at home. When bleach is combined with acids (toilet bowl cleaners, drain cleaners, metal cleaners, rust removers, hand dish washing detergents, vinegar, lemon juice, other acidic solutions, and sometimes cat urine), chlorine gas is released. Vinegar has a pH between 2.4-4.0, lemon juice has a pH between 2.2-3.0, and cat urine has a pH between 6.0-6.6. Neutral is 7 on the pH scale, so there is little to worry about when cleaning up cat urine with a bleach and water solution. When bleach is mixed with ammonia containing products (ammonia, lye, drain cleaners, automatic dish washing detergents, liquid hand dish washing detergents, oven cleaners, other alkaline substance, and feces), chloramine gas is generated - both monochloramine (NH2Cl) and dichloramine (NHCl2). Chloramines, sometimes visible as a green cloud, are powerful respiratory irritants with a gagging, penetrating odor. Even though chloramine is slightly less damaging, both chlorine and chloramine gases are dangerous. Fumes from both can cause immediate watering and burning of the eyes, a runny nose, sore throat, coughing, shortness of breath and difficulty breathing. Inhaling too much of these gases for too long can lead to mild asthmatic symptoms or more serious respiratory problems, including chemical pneumonia. A 1:10 bleach solution is caustic, so avoid direct contact with skin and eyes. Prepare bleach solutions daily. They lose their strength after 24 hours. Anytime the odor of chlorine is not present, discard the solution. Bleach is inactivated in the presence of organic matter - so clean up dirt, hair, feces, etc. BEFORE using bleach. Bleach should never be mixed with any other cleaners unless the label says it is safe. Repeated washing of metal bowls, cage wires, and silverware with strong bleach solutions will cause discoloration and metal deterioration. Use the 1:100 dilution of bleach or another product to disinfect metals. Some, but not all, liquid chlorine bleaches are registered as "disinfectants." The percent of active ingredient in chlorine bleach varies with the brand and your country. In Australia, I think, bleach concentration is less than the standard American 5.25% sodium hypochlorite. With bleach containing less than 5.25% sodium hypochlorite, you'll need to use a little more bleach when making up solutions. Don't dip your cats or kittens in bleach solutions. You'll just be endangering your kitty's health for nothing. By the time the sodium hypochlorite in the bleach reacts to all the organic matter present (skin, hair, dander, oils, saliva, etc. ), there won't be many molecules left to react to ringworm or its spores. Cleaning agents like soap and water or detergents, although not designed to kill germs, will remove large numbers of microorganisms. Many articles claim soap and water can remove 95% of all "germs". Not bad. Do you really care if the virus, bacteria, spores, or whatever are dead or alive in the mop water you're dumping down the toilet? You shouldn't. If you pre-clean then follow with a little bleach and water, you're sure to get most everything we worry about in the cattery. If items aren't heavily soiled, you can skip pre cleaning entirely. Other than cleaning and disinfecting your cattery or your home, the most important thing that you can do to keep you and your cats from getting sick is to wash your hands. By frequently washing your hands you wash away germs that you have picked up from other people, from contaminated surfaces, or from animals and animal waste. Germs from unwashed hands are most infectious when you touch your or your cat's eyes, nose, or mouth. You can also spread germs directly onto surfaces that other people or animals touch. Alcohol-based hand sanitizers have proven to be the best agent for frequent hand washing. One of the most used alcohols for this purpose is ethyl alcohol (ethanol, the drinker's alcohol). Select products with at least 60% alcohol. These alcohol-based products are available at grocery, drug, and discount stores in the liquid soap or first aid section. Use and store them away from heat and flame.